Even if my goal is to review every single shmup there is, I must admit that I am more interested in ones than others. There are many reason for that, ranging from personal preferences to availability. For instance, my preference is for top-down shooters that feature massive organic bosses that must be gradually taken down, bonus points if I am a space ship with a sword or a mech transformation. Even more bonus points if the bombs are over-the-top animations and it features a wacky score count beyond what most of our bank accounts will ever look like. 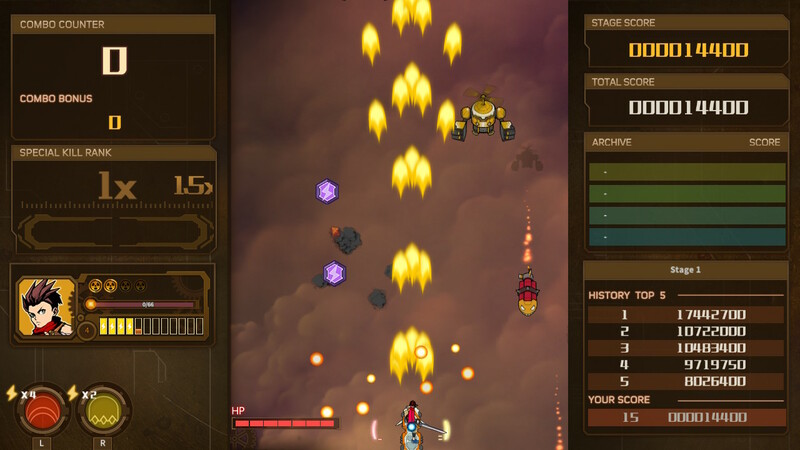 AngerForce is a top-down shmup set in the 19th century. You play as one of 4 different characters against the robot rebellion. 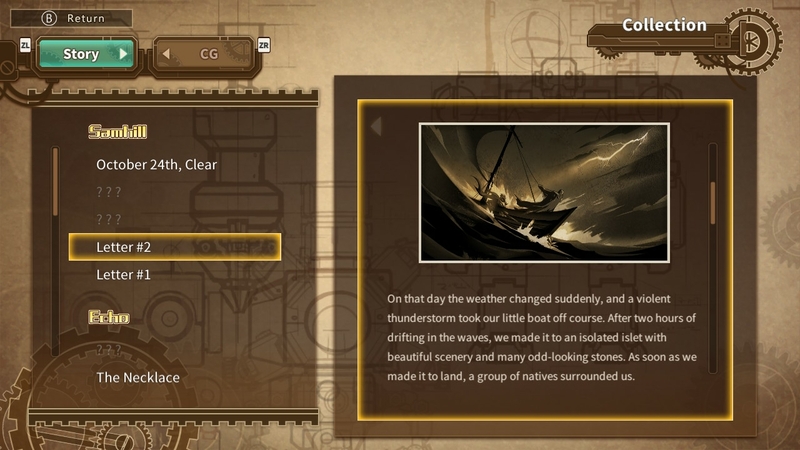 Each character features its own playstyle and its own story. Find a character for your playstyle and do your best to face against robot army! Usually for every review where I don’t explicitly mention TATE mode I’m asked if a particular game has it. Lucky for us, AngerForce does feature TATE mode and I must say that watching it on a vertical screen is a thing of beauty thanks to the art style and animations. One of the other reasons you could have been drawn to AngerForce is first place is its comic art style. The style looks really beautiful on the Switch screen and makes it easily one of the cleanest shmups available on the Switch. The other key aspect in the visuals lie in the free-form deformation techniques used in the animation. For the uninitiated, it basically makes 2D images move ever so slightly to create pseudo 3D effects. As you can imagine, the art style and the ffd go hand in hand to create one of the most astonishing visual styles for any shmup on this list. From the character select, to the cutscenes, to the boss animations, seeing how the animations play out is simply is truly amazing. AngerForce is more than pretty images, thanks to a very solid gameplay. As with most top-down shooters, you have series staples such as a fire button, a bomb button and omni-directional movement. Ok, maybe omni-directional movement isn’t a staple, but I feel it is my duty as a reviewer to highlight those games which are wise enough to give the player 360 degrees of movement thanks to the analog stick. Where AngerForce dares to break the mold is with the skill system. By pressing L or R, you can unleash one of two unique skills for your character. These skills are pretty strong, but they come at the cost of energy. Energy can be obtained by collecting energy power-ups from fallen enemies, or by charging. Charging is done by holding the A button. Charging energy makes you unable to shoot but you can still move. As you might expect, this creates a unique dynamic between offense and defense. Are you willing to cease fire and focus on dodging to fill your energy bar? Or will you opt to keep shooting and ask questions later? My favorite buttons by far are ZR and ZL. ZR and ZL allow you to move faster or slower while you hold either of those buttons. I’ve placed a lot of emphasis before on movement mechanics, stating big offenders such as R-Type’s terrible speed up system, or nudges in the right direction such as Devil Engine. For me, AngerForce has the definitive way of mapping speed to buttons, as ZL allows you to carefully maneuver enemy patterns, while ZR gives you the speed to dodge quick enemy moves. 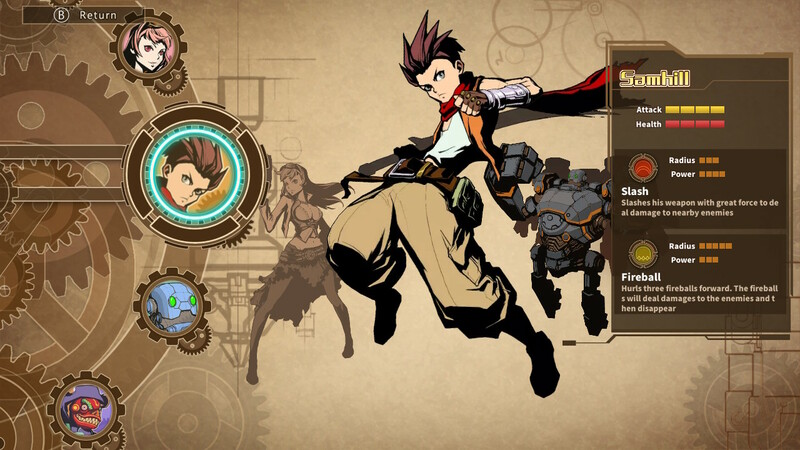 Each of the 4 unique characters feature a distinct play style. Think of them as different classes on an RPG game. Samhill is your balanced all-around character. Echo is your glass cannon assassin that deals high damage, but dies just as fast. Asimo is your tank, as someone who can withstand a lot of punishment. Finally, Shin is your wizard style. Each character also features distinct attack and health stats. So you decide if you prefer damage or survivability. If picking characters isn’t enough customization for you, then let me tell you that AngerForce also features a very robust upgrade system. As you play through the game, you will acquire blue orbs. These orbs can be spent after your run is over to gain permanent upgrades. There is a huge amount of upgrades available, but you can find them ranging from simple number upgrades such as 25% more attacks, to unique abilities such as withstanding a fatal hit. The upgrades are separated into general and character specific. General upgrades are applicable for all characters and they feature most of the upgrades available. Character specific upgrades augment the unique skills for each character. With enough game time you can max out all the upgrades, but it is entirely up to you in which order you will do so. The funny thing is that the upgrades are applied just like how Dead Cells manages the blueprints. That is, you have a number of orbs and allocate any number to any given upgrade, with it being unlocked once you meet its criteria such as 20 orbs. If you try to exit the upgrade menu, you are asked if you want to discard the orbs or you can use them on incomplete categories… like in Dead Cells! The 2 main modes are arcade and campaign. Arcade is your typical stage by stage play mode. You go through all of the stages until you either die or beat the game. Not groundbreaking by any means, but a tried and true mode which should be present on most shmups. 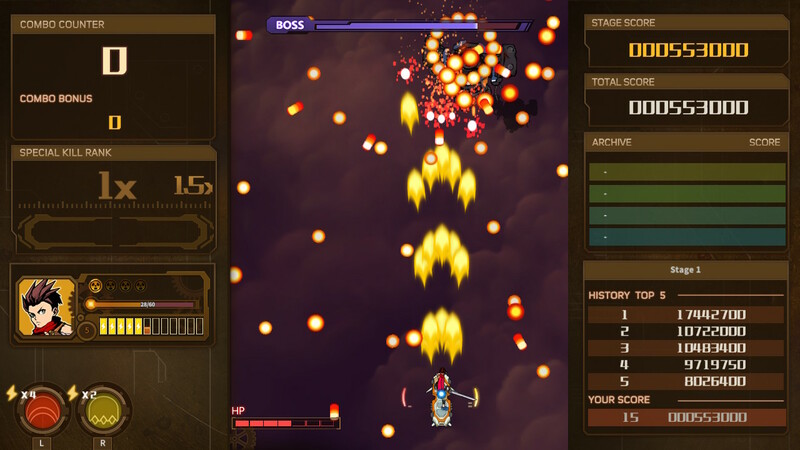 Unlike most shmups, you have a single life to make it through the entire game. Each character does possess its own durability, so the amount of times you can be hit varies from character to character. In a way, the HP is similar to a lives system, with every run being a 1CC. You can replenish a lot of HP from levels, so that’s better than chasing extends with your score. But don’t panic, if you die, you can choose to continue by paying a hefty price in blue orbs. If will subtract from your ability to get permanent upgrades, but at least you’ll be able to continue your run. Campaign feature a more robust package, with 4 different difficulties and a unique story for every character. 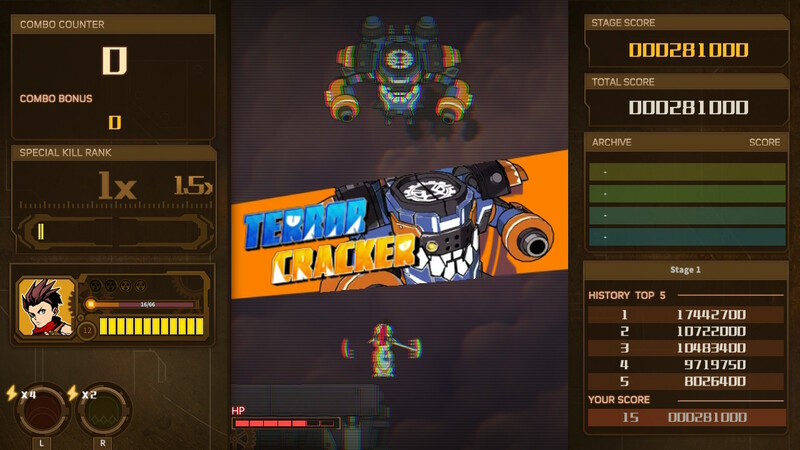 The difficulties differ a bit from other games, as they represent progression in AngerForce, by every difficulty allowing you to play more stages until you finally unlock the last boss. 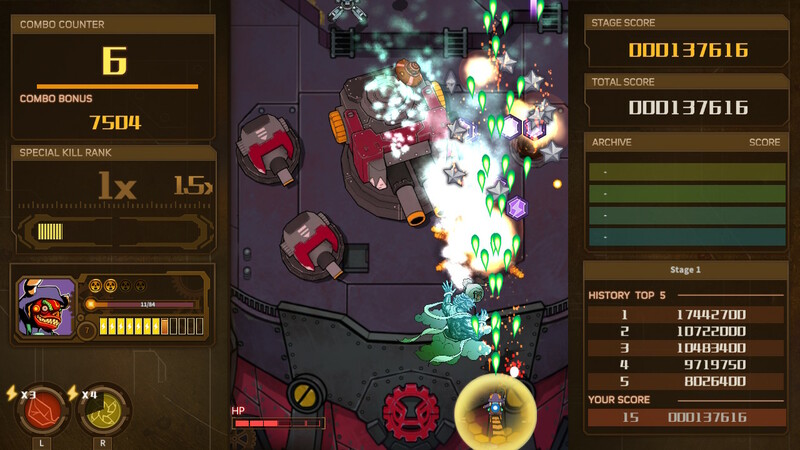 Scoring in AngerForce is deeply ingrained within the skill system. Killing enemies with skill will increase your special kill rank, which is a score multiplier. Hitting enemies with skills will also increase a combo counter, which last until a timer runs out but can be reset by getting more skill hits. Adding the score system to the charge system, you can see why there is a reason to balance offense and defense. You want to get those special kills and combos, but you also need energy, so clever players will find a way to charge when enemy concentration is low and attack when they can easily max their special skill rank and look to go for the highest possible combo. At the beginning I felt intimidated by the system, but eventually I found out that it made me much better at handling my own skills. My play style went from one where you hoard energy and unleash on a single boss, to one where I used it multiple times during a level for score. What sets apart a good game from a great game are those details that nobody asked for, but which are amazing to see. One of my favorite details is how the readiness of your skills is displayed at each side of your character to show you that you have enough energy for that. But not only that, you also have tabs indicating the number of times you can use said skill before running out of energy. The other detail I can think of that delighted me was the blue orb that appears over your character when enemy fire is present on the screen. That orb represent your hitbox, and you know I love to know my own hitbox! Sadly there’s also a couple of bad details, and they come from the animations. The one that stands out the most to me is how enemies turn red as their health decreases. This isn’t bad per se and is a frequent mechanic used in the 90’s, however the gradual redness feels off, like it is too sudden and the tones of red are very far apart. In my opinion, the far superior mechanic is when the enemies flash red, quicker and brighter as they approach defeat. Oddly enough, the tank boss does feature this blink when hitting the turrets, so who knows why it didn’t apply to the other enemies. My other complaint would be the bullets. AngerForce keeps it simple with orange and red bullets, but they do blend with Echo and Samhill’s shot colors. They also lack the usual pulsating flair that makes them easier to see. As weird as it may sound, I don’t have much to say about the music. The game advertises multiple tracks, but I found most of them to be just average. The sound effects are also sort of mute which usually bothers me, but since AngerForce slows everything down when you take a hit, so I can live with it. The game does seem to be mute on weird places such as the victory screen of the upgrade screen. I wish there were fanfare or at least some BGM to hear in the meantime. Mute moments are very noticeable. The one thing I actually didn’t like was the voice-acting. I’ve been known to be unable to recognize good from bad voice-acting in the past, nonetheless I think most lines are pretty dull in terms of tone and fail to convey actual emotion. All in all, I think AngerForce is a good game. It has some unique and outstanding ideas, but on its high points is still feel like just a slightly above average. I think for this particular case, polish would make it a must-buy game. Polish in the form of more fluid animation transitions, more flair to the bullets, more impact to sound effects and even additional tracks on the victory screen. AngerForce has a lot of quality distributed across many places. It is good for a game, but I keep trying to figure out a single aspect I think it excels at, but I keep finding a game that does it better. As I said, it is a well-rounded game, but I wish there was more of that “oomph” factor that leaves a lasting taste.